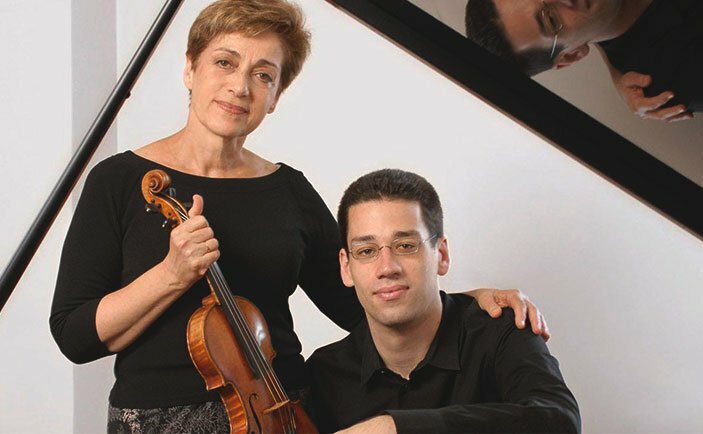 In Sunday’s “Bartok and Schumann Project” at the ISGM, violinist Miriam Fried provided both outgoing expressive projection and quiet eloquent tone in ample measure; it was gratifying to hear relaxed but confident playing that was mighty at the same time. With a clear, smooth, and never strained sound, beautifully proportioned to the large Steinway piano with its top removed, her son, Jonathan Biss, proved the perfect partner in the musical dialog. The family connection assured the right kind of intimacy and earned rapt attention throughout from the four-story audience in Calderwood Hall. Schumann’s A Minor Violin Sonata, op. 105, composed 1851, doesn’t have the overflowing melodic brilliance, formal audacity, and general good spirits of the Piano Quintet, op. 44 , and Piano Quartet, op. 47, composed eight years earlier; but it compensates in warmth of expression and formal concision. This is late Schumann, in full command of his technique even though less boldly original than in his earliest maturity. It looks forward to the Brahms violin sonatas, which are more sprawling and (I confess to heresy) often less interesting. The first movement of the Schumann has plenty of leidenschaftlicher Ausdruck, passionate expression, without spilling over in drama, and its well-integrated sonata structure includes a wonderfully subtle transition from development to recapitulation. The second movement, an Allegretto that Schumann could just as well have marked im Volkston with its almost Scottish melody, presents a small-rondo form in F major alternating with D minor; the Lebhaft finale offers a definite contrast with its abundance of skippy-scratchy staccato, but this too is well set off with a breadth of cantabile in sound (and brief cyclic recall of the first-movement theme near the end). Schumann’s Three Romances, op. 94, are all of smaller proportions than the Sonata, at about two minutes each, and all three are gems. They are tonally related, of course: A minor, A major, A minor, and properly einfach (simple) and innig (intimate), which are the tempo markings of the second piece. It’s easy to imagine that Edvard Grieg had the third one of these Romances in mind when he wrote Solvejg’s Song in Peer Gynt. Composed in 1921, Béla Bartók’s Violin Sonata No., 1 Sz. 75, is in large measure a large, stern, gritty work of rapidly-changing moods and textures, not to mention a rapidly-changing balance between tonal, paratonal, and atonal harmony, in three long movements (each lasts about ten minutes). It comes from the time when Bartók’s harmonic sense was still in transition between post-Brahms-Strauss rich tonality and post-Great War atonal despair that was felt by many composers at the same time. Other works of his in which I discern the same kind of harmony are the Suite, op. 14, for piano (1914), the String Quartet No. 2 from 1917, the Piano Sonata of 1926, and the ballet The Miraculous Mandarin (1919). All of them especially admirable and brilliant works feature a harmonic language that is sui generis, inchoate and at times experimental. One notes in this first sonata some characteristically Bartókian features, too: the predilection for Scotch snaps (short-long), with figures like paired sixty-fourth notes followed by a double-dotted eighth; the bouncing boom-chick piano style that Bartók cherished as early as the Allegro barbaro and the Opus 14 Suite, and that forms the frantic accompaniment in the third movement — this might even be a csárdás, the Hungarian equivalent of a fast polka; the fondness for contrary-motion melodic lines in parallel thirds (again familiar in Opus 14). By contrast with this Violin Sonata, the Sonata for two pianos and percussion (1937) and the Contrasts for clarinet, violin and piano (1938), and the orchestral music from the same period, all show a more stable, tonally regularized harmonic language. Which is not to say there aren’t significant tonally strong episodes in this sonata — in the second movement, for instance, the violin’s extensive unaccompanied passages are answered by crystalline chords in the piano, including some in parallel major triads (remembering the dazzling passage in Bluebeard’s Castle when the fifth door is opened). If one heard echoes of Ravel’s Tzigane (1924), that would be because Jelly d’Arányi, for whom it was written, probably played this Sonata (also written for her, as was Bartók’s Second) for Ravel in person. It will take me some more hearings to grasp this First Violin Sonata with the understanding that it deserves, but I had no doubts about the mastery of the thrilling take by our own Miriam Fried and Jonathan Biss. They made light of the considerable technical difficulties, and obviously enjoyed themselves to the full. I look forward to next Sunday afternoon, when we will hear the second violin sonatas of Schumann and Bartók in the second installment of this project.